Heat Master Stock in a pot with soy, ginger and sesame oil. Bring to the boil and reduce to a gentle simmer for 15 minutes. Slice the tofu into 6 pieces and put on a plate. Heat water in steamer. Place plate of tofu over heat for about 10 minutes, or until hot. Slice washed spring onions into 5cm lengths. Add shiitake mushrooms and spring onions to Master Stock and simmer for a few minutes. 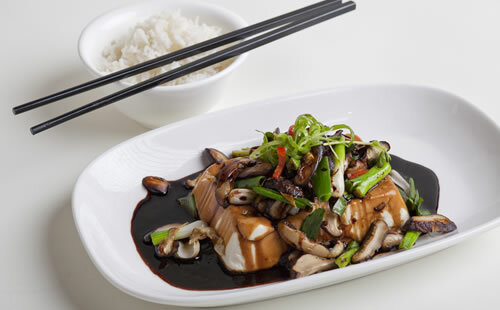 Place tofu on serving platter and pour the mushroom and Master Stock mixture over the top. Accompany with fresh egg noodles or steamed rice.